Now is the winter of our discontent — hacky, I know! — with Ontario University Athletics' use of RPI to seed the basketball postseason. Fortunately, there is a workaround. 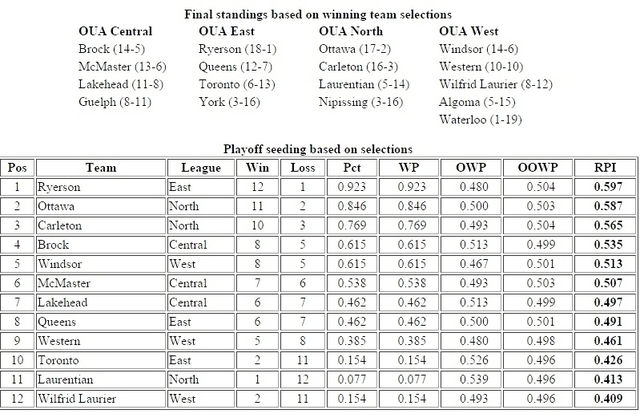 The main takeaway from the yeoman's work the invaluable Martin Timmerman is doing with the OUA rankings is that it might be better to look his CIS Hoops' projections before the official update, in order to best understand this playoff race that is unverifiable by mental arithmetic. Full disclosure: your agent was, and is, in favor of using analytics to resolve the issue of power programs all residing in the same division, whether it was the women's West division when Windsor, McMaster and Western were dominant or the men's triumvirate of Carleton, Ottawa and Ryerson in the East. The application is definitely problematic; RPI's main use in NCAA Division I is comparing teams with few common opponents, but a conference season is all common opponents. A team's record is also weighted only 25 per cent in RPI, with opponents' winning percentage counting for 50 and opponents' opponents winning percentage counting for 25. Another RPI issue is scale, since each team plays their three or four division opponents twice and everyone else once. That can bestow an advantage to a team by virtue of no more than geographic location, which is what this system was supposed to factor out in order to send the best three teams to the Final 8. Atlantic University Sport has long got around that problem by double-weighting games between opponents that, due to travel costs, only meet once. The OUA could easily use winning percentage with the value of a season series cut in half, so a split would essentially be a tie. Anyway, rant over. Some actual observations about actual basketball games. Ottawa hasn't been a fourth-quarter team of late, whether it was in their Ryerson and McMaster road losses or their second win against Carleton and the Brock game on Saturday. Mike L'Africain (33 points, four assists) and Brock rookie guard Tyler Brown (28 points) put on a show on Saturday, with L'Africain persevering through some well-timed presses and some Ottawa turnovers. Caleb Agada is back, but didn't seem to get a lot of run offensively in either game. Matt Plunkett lived up to his 'Massive Shot Matt' moniker with five triples, including a dagger that opened an 11-point margin with a minute left. In the 96-90 loss against McMaster, Ottawa led by 15 midway through the third quarter. Then it went cold and Amos Connolly's crew, which is hellbent on being pace-pushers this season, heated up and also went to the offensive boards, which grounded Ottawa's transition offense. For fun, tally up the combined line for Troy Joseph, Leon Alexander and Rohan Boney: 81 points on 28-of-46 from the floor, with 7-of-11 from three for a 68.5 per cent eFG%. That leaves 15 points on 3-of-18 for the rest of the Marauders. Joseph was 7-of-9 from three, including the triple that put Mac ahead for good, as he tallied 30. Please understand it was a superlative effort and anything that's a harbinger of parity is welcome, but it's fair to wonder what the odds are that Mac's big triumvirate could recapture that magic in another big game. Against Carleton, Maroon Three (I'm so, so sorry) combined for 33 points on 12-of-37, including 3-of-8 from three for a 36.5% eFG. Sometimes good nights and bad nights are just good nights and bad nights. One shouldn't make anything of the fact Ottawa has lost in its next outing after defeating Carleton. They lost close road games to Top 6 teams. There is no cause-and-effect. Whither Carleton, which held both Brock and McMaster to 65 points? Connor Wood (22 points on 60.9 eFG%) seemed to have more pep in his step, and Guillaume Boucard (14 on 70% eFG) also had a nice night. They are among the living, so there is that. Brock is a fun team with Brown, Johneil Simpson (21 and 10 vs. Ottawa for a double-double), Dani Elgadi (who was plagued by foul trouble vs. the Gees) and fourth-year Ryan Bennett. They are small, with Elgadi and fifth-year Matt Marshall being the only rotational players who are 6-foot-6 or taller. They are not deep, and that element really comes to the forefront at the Final Four with back-to-back grinders on Friday and Saturday.